It has always been said that the kitchen is the heart of the house, however that was not the case during the Victorian and Edwardian eras. In today's world, the kitchen has become a gathering place for families to meet and share the experiences that they had during the day with other family members. But during the past eras, family members rarely came into the kitchen. During the Victorian and Edwardian eras, the kitchen was considered a room that was only used by the cook or servants. 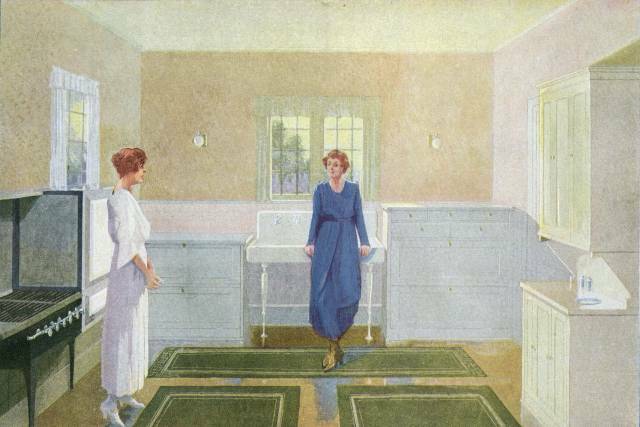 In homes of those that were of lower class, the kitchen would be used by the lady of the house, however at that time many families had servants. Floors were made of wood and often covered with linoleum which would be in a tile pattern. The walls would be a dark wood and the only decor would be the variety of utensils that were used to cook and prepare food. The furniture of the kitchen was minimal. There would be a dresser which would have a cupboard and shelves. One shelf would be made of marble or a similar material which would help keep the food cold when placed on it. Along the dresser would be a work surface and below that surface would be drawers to allow the cook to store cookware and utensils. Also in the kitchen would be a wooden work table. This table would offer the cook the opportunity to have room to prepare the meal for the family. Most prep work would take place on this table since it provided plenty of room. The work table would usually have marks from the daily use of a knife as well as common wear and tear. This piece of furniture was exactly what the name implies a work table. In the kitchen would also be a few chairs as well as a standard rug on the floor. Pots and pans would usually be hung from a hanger that would come from the ceiling to help keep them accessible and in reach. There may also be a variety of wines, especially if the family produced them. The kitchen would often be given light by candles or oil lamps. A stove that was fueled by fire would produce the meals for the family. Simple curtains would hang from the windows and would provide the only decorative feature for the room. Most curtains for the kitchen would be light and thin, which would allow enough sunlight to enter the room. As time changed, the kitchen became more family friendly. A kitchen table was added which was used for both food prep as well as to having informal meals. The dresser that once held food and kitchen utensils started to diminish and the presence of built-in cabinets graced the walls. The decor of the kitchen, which used to be minimal, now became more present to the guests. Themes were established and the colors of the kitchen's overall appearance became bold and vibrant. Instead of a kitchen being used by a cook, the kitchen became the place that the lady of the house was often found in. Family members would often gather every morning for breakfast and would also gather for other meals. The dining room became a room that was only used for special occasions and was considered the formal room. Throughout time, the kitchen has gone through a variety of changes. Most of the antique furniture that embellished the kitchen during the past eras is no longer needed, and modern enhancements take over what once was a simple way of life. The kitchen has transformed from being a room only used by servants and cooks to a room that is considered the heart of the home.